Up until now, I've only had giveaways of my redesigns. 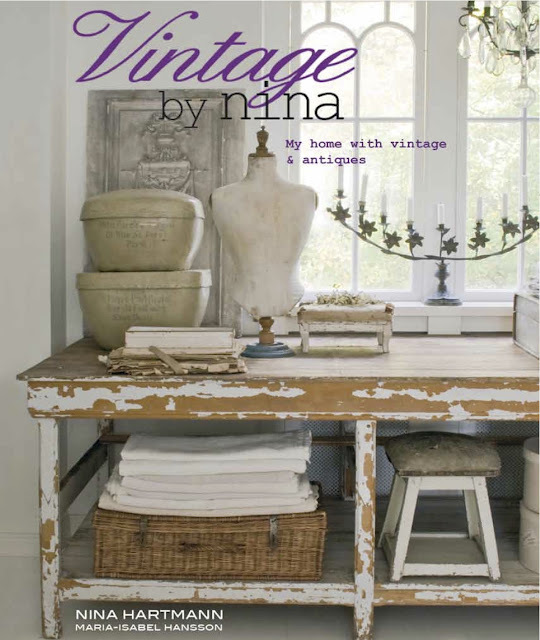 However, when my friends at Atelier de Campagne told me they had been chosen to be the North American distributors of Nina Hartmann's book, "Vintage by Nina", I was excited about having a giveaway for my followers. Even more so when I exchanged e-mails with the talented Nina Hartmann. 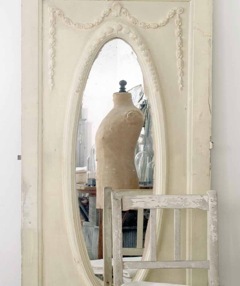 Nina Hartmann is an internationally known stylist of interiors and purveyor of vintage treasures. 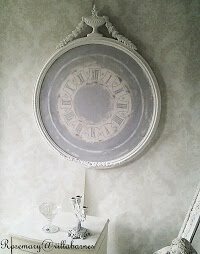 For the past eight years, Nina has run the vintage and antiques shop vintagebynina.com, and has a showroom in Sweden. Nina's style, love of design, and unique vintage items, have made her one of the most respected and talked about figures of design and style in Scandinavia. Nina is also quite generous. She has autographed a copy of her stunning book for me to give away. Page after page of loveliness. It has over 160 pages, and 300 color photographs. Even though the giveaway copy of Nina's book is in Norwegian, the photos speak for themselves. If you are interested in acquiring this book for resale, contact Atelier via e-mail infoatelierdc@gmail.com for details and info. Title your e-mail, Wholesale VBN. Pre-orders need to be taken ASAP, in order to get the book to you by mid-September. My only compensation for this giveaway, is a copy of Nina's book for myself. WOW! Rosemary. What a great looking book. I'd love to enter the giveaway. I would love to win this fabulous book. please enter me. i'm already a follower. I've now shared your giveaway on my blog. Please count me in! You know I love your style and the book looks gorgeous. I'd love to be entered, Rosemary - the book looks beautiful and full of inspiration! I would love a chance to win Nina's book! I follow you and love your beautiful blog. I would love to be entered for the book, I am already a follwer. Thank you. Please throw my name into the hat; I am already a follower. Thank you! I would love to be entered, as I am a faithful follower. Thank you. Am a loyal follower of your blog and would love to have Nina's book. Thanks! OOOH, This book looks gorgeous, please enter me. I'm a stalker I mean follower LOL. Rosemary, The easiest thing I've done all day is to finally follow "Villabarnes" after reading your lovely blog for the last year! 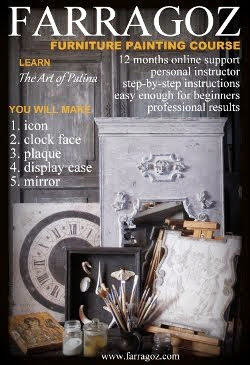 I'd love to have Nina's book-I did see it featured on Atelier de Campagne. Thank you for the chance to win! I'm already a follower - oh please let me win this!!! What a glorious book, thank you so much for the introduction. I've shared this on Pinterest as well! What a great opportunity to win a beautiful book! Thank you! What an awesome giveaway! I am huge fan of your blog! I look forward to receiving your posts! Thanks for the giveaway. A fantastic giveaway! Enter me in this giveaway. and Thanks! I posted on my facebook about this wonderful giveaway. Please enter me again and thanks a bunch! Yes I follow you! and thanks for the opportunity as it appears to be a wonderful book that I would love to see! I'm already a follower, and I'd LOVE to enter your giveaway! I'm already a follower and would love to win the book! You're on my sidebar. Love your blog. I don't think you need words for this book. Yummy! Please enter me in this great giveaway! I would love the opportunity to own this book. I am a follower of your blog too. I am a follower and would love to win!! It looks like a marvelous book! I am a follower and would love a chance to win. HI ~~~ I am a follower of yours ~~~~ Thank you for the opportunity to receive the book. oh pleeeeease enter my name for this wonderful book!! I just posted on my FB page about your wonderful blog and giveaway! I am a follower and would LOVE to win this gorgeous book!! Thanks so much for the opportunity!! I am already a follower and would love a chance to win this book, Rosemary! I am already a follower and I would like to enter! Thank you for the chance to win this gorgeous book! I'm already a follower and would love to win this book! Thank you for the opportunity. Hi Rosemary, you know I'm an adoring follower, please enter me in the Give Away, I'm a huge fan of Nina's! Rosemary, I'm already a follower of your gorgeous blog. I receive your posts by email. Thanks you for the opportunity to enter this amazing giveaway! I'm a huge fan of Ninas. Please enter me in this giveaway- I shared this on Coastal-Colors' Facebook page. I would love to win this fabulous book. I would keep it in my office for daily inspiration. I'd love to win that book, been a follower for quite some time! I am definitely a follower and have even tried some of your techniques! I want to enter! I'm a follower and would love this book. I'm a follower, Please add my name to the hat, Lovely book! Thank-you! Yippee, Skippee!! It's official I'm now a follower, and I must say, in such good company. How sweet of you and Nina to share such a treasure with a lucky reader. Please enter my name for the opportunity. Beautiful book...thanks for a chance to win it! I'm a new follower! I have been a happy follower of you blog for a while now and would love to win this fabulous book!!! Rosemary- have enjpyed being a follower of your blog and thanks for the opportunity to win an autographed copy of Nina's book. i am a happy follower! that book looks so dreamy to thumb through! I am a happy follower my friend! Please count me IN! 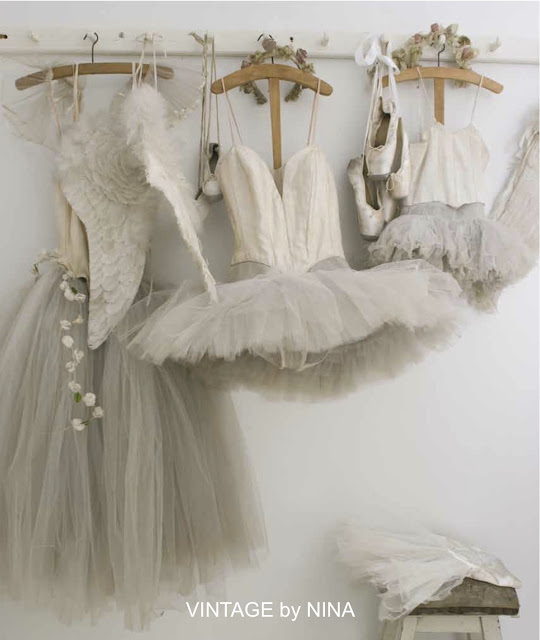 Just beautiful -- I ADORE that picture of the vintage tutus! Thanks for this give away -- I'm already a happy follower and would love to win this book! Adding this to my blog list of give aways! Gorgeous! I would love a chance to win this amazing book, I am already one of your followers:) Merci! I am a new follower and would love a copy of her new book! Rosemary, I am already a follower and would love to be entered in your giveaway. THANKS. I am a follower and would love to see this book. It looks wonderful. Thanks for the opportunity. I am already a follower and would love a chance to win this beautiful book. Brand new follower... Oh yes........I'd LOVE to win this awesome book.... it looks dee.lish. Perfect giveaway for your blog too Rosemary! 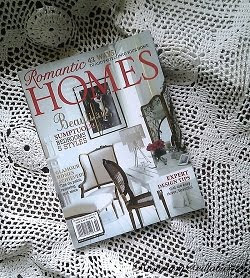 I am a follower and a decorating book addict, so please enter my name to try to win! LOVE this look, as you probably know...LOL. Please enter me, I'd soooo love a chance to win and YES, I follow you here and on FB. How did I almost miss out on this great Giveaway of yours? Yes please enter ME! and thank you to Nina for putting together amazing beauty that touches our souls, as well as Atelier de Campagne for including you as a beautiful site to do a giveaway! 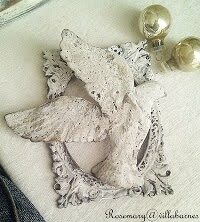 I follow you my sweet friend, thank you again Rosemary, As I stated in my latest posting "It is better to be lucky (Blessed), than rich"
Blessings to the winner of this soulfully white book. I have posted you on my sidebar as to your beautiful GiveAway right above Anitas Paris Link party. Thank you again for this beautiful chance at a win. I just now FaceBooked you on my wall. Rosemary I mailed the giveaway from my email list directing them right over to you. I am going to mail two email address sites of mine directing them over here for your beautiful giveaway. Hi Rosemary, I'm already one of your followers and would really LOVE to win this beautiful book! Thanks for the opportunity. Here's enry #2 for me. I just posted about your give away on my blog! Because I really want to win, here's entry #4 with a Facebook post! I just became a follower - thought I already was as I read this blog. Would love to win that book! I'm a new follower and happy to be here! Thanks for the opportunity to win such a lovely book. Rosemary this is wonderful! Of course I would love this book!! Of course I am a follower! Congratulations on all of your family celebrations!! I would love to be entered into your giveaway! I think this would be a fabulous book to have. Just posted on my FB pages La petite boutique de perles and my personal page. I just became a follower with google friend connect. I would love to win this lovely book in french or english. I can do either. Sharing give away on FB. shared on my fb page too!!! 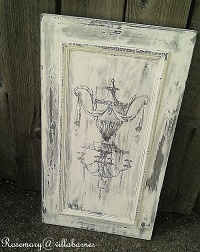 crossing my fingers...would love to own this charming and fasinating looking keepsake! This book looks so wonderful and I thank you for the chance! I am a happy follower and will be keeping my fingers crossed! I've been a follower for "a-wonderful-while" and I'd love to enter the giveaway for this fabulous book. Here's hoping! I shared your post about the giveaway on my blog. I'm a follower and would be thrilled to win! What an awesome book and maybe I could learn a few new words in a foreign language! That could be an added bonus! I would love to win this exciting book, please put my name in. I am a follower. I'm sharing on my Facebook page too. Thanks Rosemary. Looks like a wonderful and inspiring book! I have been a follower for awhile! Love your style! I have this posted on my blog's Candy Corner! What a fabulous giveaway! I'm a follower and would love to enter. Thanks so much, I'm going to see how many other ways I can build up my chances of winning heh, heh, heh! 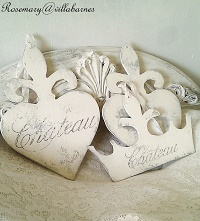 I'm so happy to have found your blog...I LOVE LOVE LOVE it! I'm now a follower and would love to be entered in your drawing. Looking forward to reading your previous entries and the new ones, too! This looks like one wonderful book and I would love to WIN it:) Oh yes...I'm a happy follwer. Shared the giveaway on my facebook. Hi, I am a new follower to your blog. I look forward to catching up with you. I'm your follower and I'd really like to win this amazing book! I'm a Linky Follower--it looks like a lovely book! I am a follower and would love a copy, please enter me. I'd love to be entered into this lovely giveaway. I am a new follower, and already hooked! Great stuff! I can't wait to get out to St Charles again. Forgot about Twitter!!! Now tweeted. Tweet. Tweet. I love to curl up in bed with a good picture book. Hi Rosemary, I am a follower of your wonderful blog. Your talent amazes me! Thanks for the opportunity to win this fab book! I am posting about this give away on my sidebar. Thanks again! Rosemary, you are one very talented lady. 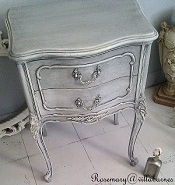 I absolutely love how you take an ordinary piece of furniture and turn it into an extraordinary piece of furniture. I would love to win a copy of Nina's book in any language.